There’s something about miniature versions of everyday things that just makes us go aww. Potted plants are no different, from cute bonsais to tiny cacti, they make for amazing home décor and even gifts, especially when made the way these guys make them. Little House OF Terrariums make miniature gardens in a glass bowl/pot, often times with tiny attractive decorations within them. The allure of it all lies in how attractively each terrarium is presented. Lots of effort is poured into details, like what colour the soil has to be, what rocks to add, what plants to use, what pots to put them in, and quite frankly, the level of customisation that goes into each one really shows in each of their terrariums. These terrariums can be ordered by contacting the company through their Facebook page. For customers, they’re actively looking to customise each order to suit needs. They’re well equipped to handle large orders too, in fact, one of their recent orders was a consignment of tiny terrariums as return gifts at a wedding, all attractively packed in paper bags. We are loving their Hanging Tear Drop terrariums, perfect for your living room or balcony. The Wardian Case ones are equally gorgeous. 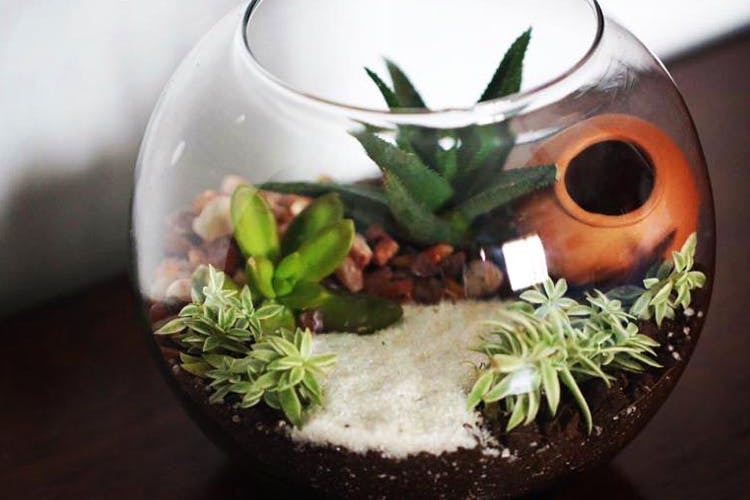 Prices for their terrariums start as low as INR 150 and can go up to INR 5,000. The lower priced terrariums feature just one single plant, whereas the more expensive ones can be quite big and fairly intricate. They recently made an elaborate fairy garden for one of their clients. The pricing includes all the equipment and manpower, so rest assured you won’t have to shell out extra cash for a nice glass bowl. They offer design services too in case you’re looking to decorate your balcony or office with their terrariums. In fact, if you’re so interested you can sign up for one of their DIY terrarium workshops, where they teach you how to build your own terrarium (they provides all the necessary material).